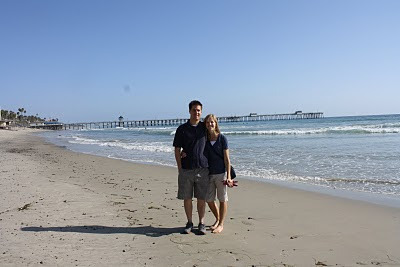 For Micah's 34th birthday we took a surprise trip to San Clemente, California. Our friends gave us a weekend at their beach house as a wedding gift, so I planned trip and kept it a secret until we boarded the plane to Long Beach on Thursday evening. Text from Jeff: There's a 30-50% chance that any random person is driving right by John Wayne heading south. So strike up some conversations with someone waiting to get picked up. Or talk really loud about it close to them. And I'll bet in 1 to 3 tries you'll be able to get a ride. Better yet ask someone on your flight, cuz then they're mormon and more trusting of you as a fellow mormon. Jeff: Freshman year I got a ride hom from LAX, just made a sign that siad Irvine and stood by where the cars pick people up, and some guy took me all the way home. Micah: That's it...Here goes. Sign made. The beach house is amazing! It looks right over the beach and pier...and it's huge! We open the doors for air conditioning and can hear the waves all day and night. It’s so relaxing. This is the condo. We had that first balcony (all the way around) to ourselves- amazing! These are the little presents from Micah’s birthday treasure hunt. Such excitement! Micah also had his 15 year high school reunion on his birthday. There are few things that Micah REALLY wants to go to, but this is one of them. Luckily we had some Delta credit from our Europe trip since we were delayed 24 hours on our flight home, so we took a vacation from our vacation and flew back to Utah for a day to attend his reunion. It was well worth it. We saw lots of his old time friends and learned about the different joys and challenges that they've faced in that last 15 years. Friends make life so sweet. After the reunion we went up to Park City to go see one of Micah's latest real estate purchases. He didn't have the keys to the place yet, but was anxious to see the inside, so he immediately went into MacGyver mode to break into his own place. On Labor Day we visited the San Juan Capistrano Mission. The architecture was so stylish. The spanish style you see these days was inspired by the early missions such as this one that was established in 1776. This was a fountain full of lily pads and huge fish right at the entrance of the mission along with pictures of some of the architecture inside. This is called the great stone church. It used to have seven domes, but now there is only one that remains standing. An earthquake in the early 1800's caused most of the the damage in which 40 people were killed. Still this is one of the greatest and oldest standing ruins in the United States. This is an alley from inside the Mission. Across the street we visited the Capistrano Trading Post and found some of the same souvenirs that Micah had seen there over 20 years ago while visiting Capistrano with his family. 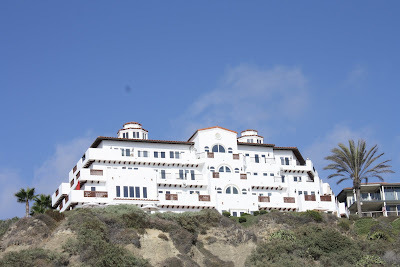 On our way back from Capistrano we cruised along Pacific Coast Highway (PCH) and saw a sweet car with red leather interior. 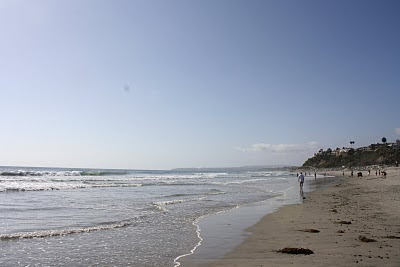 It seemed to fit so perfectly at San Juan Capistrano Beach. We also stopped at a thrift shop on the way to the house. 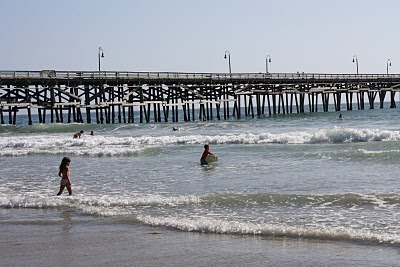 We went boogie boarding in the freezing cold water at San Clemente Beach just down from the beach house where we stayed. It was really fun, but short lived because the water was so cold. We ate at the Jolly Rogers restaurant at Dana Point that night for dinner. The food was awesome. I ordered the Plantation Ono fish with mashed potatoes and steamed veggies. Micah got coconut shrimp and teriyaki chicken. They served warm sour dough bread as an appetizer. It was reasonably priced and Cathy our waitress from Minnesota gave fabulous service. Highly recommended. 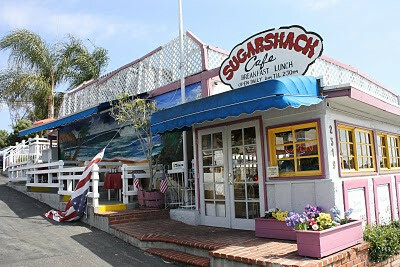 We ate lunch at The Sugar Shack - great place for breakfast food. Definitely a local's delight. We don't want to go home tomorrow! This has been such a wonderful trip! jeff just sent me a link to your blog. haha, micah looks just like the twins did with their birthday balloon surprise. Your trip looks like it was so fun! I'm so glad the Long Beach predicament worked out. Jeff is the best!